Acuvue Oasys Astigmatism 1 Day HydraLuxe 30 Pack contact lens is Acuvue's newest daily contact lens for astigmatism. 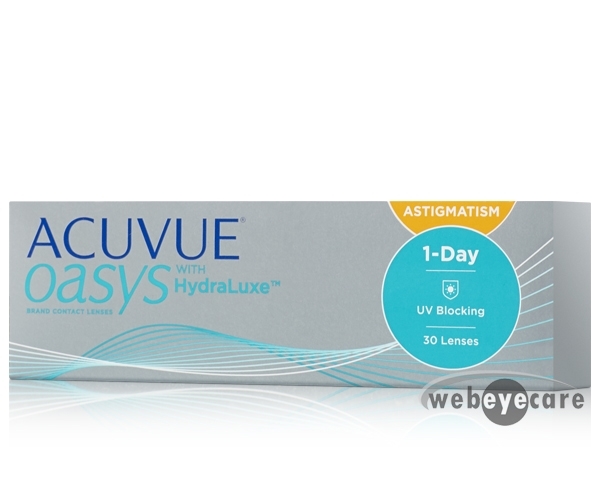 Acuvue Oasys Hydraluxe for Astigmatism is the latest one day (1-day) lens released by Acuvue. The 1-Day Acuvue Oasys Astigmatism Hydraluxe lens comes with significant improvements over 1 day Acuvue Moist for Astigmatism. This new daily Acuvue lens uses new Hydraluxe technology that provides enhanced moisture to the eye resulting in fewer dry and red eyes, even after a full day of wear. Only a quarter of the price of the eye doctor, but the same exact product. I will definitely be buying from webeyecare again. Great buy and received in timely fashion! Would not hesitate to recommend and order from you again!